Elephants are the largest and one of the smartest animals on earth. They are majestic and has been a tourist attraction especially on South East Asian Countries. The problem is, despite their size and gentleness, they are also one of the most abused animals especially in captivity. Some of the so-called “sanctuaries” are not ethical and can be harmful to the elephants. But there also those sanctuaries that try their best to make sure that the animals are safe and not stressed. The one thing that should always be avoided when visiting these sanctuaries is riding the elephants. As more tourist has been educated about the abuse and unethical conditions the elephants goes through, less and less are becoming interested in riding them. The elephants can die from severe exhaustion as in the past, a lot would like to try to ride them, forcing them to work all day carrying all the weight plus the lack of food in dry seasons. Another big issue is forcing the elephants to do tricks and other circus acts for a show to entertain the audience. Because even if they are known for their intelligence, they are not doing these tricks because of that, but because of enduring the physical abuse their trainer does until they are broken and would just submit to the will of their captors. In order to really enjoy the presence of elephants in the sanctuaries, there are still activities that other sanctuaries offer that does not abuse the elephants. But before doing all these activities, it is recommended that you wear the traditional attire that the sanctuary offers because even if the elephants does not know you, they recognize the attire, making them more relaxed. Most ethical sanctuaries would let you help them feed the elephants fruits such as giant bushels of bananas. Learn more tips about the preparation before visiting any elephant sanctuary here. Some sanctuaries even offer activities such as safaris where you can feed, bath, and walk with the elephants across the jungle that they call home. Some tour also offer the opportunity to learn more about the gentle giants by intimately taking care of one. From training on how to properly approach them, to how to check their health, and how to communicate with them. It is a challenging and time consuming learning experience but a great chance to become close to one of nature’s most majestic creatures. And if being hands-on is not for you, you can still just observe and see the elephants in a happy and natural environment free from chains and abuse. You can observe mother elephants with their babies, pregnant elephants, and everything in between in their natural habitats. Although mistreatment and abuse of elephants are still not completely eradicated and some still make money because of this, more and more sanctuaries are dedicating their time and effort in order to provide a safe, healthy, and happy home for them. 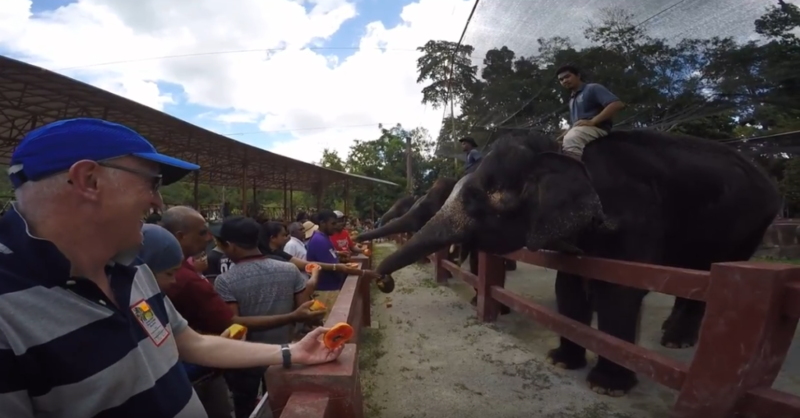 There can still be a happy and wholesome experience that can be achieved through sustainable eco-tourism projects that can promote proper and humane treatment of elephants and in the same time, inform the visitors and public about the issues and consequences of irresponsible tourism practices.